Adam M. Grant was born in the township of West Bloomfield, Michigan on August 13, 1981 to a lawyer father and a teacher mother. He grew up in the suburbs of Detroit, Michigan. Grant participated in springboard diving and aspired to be a professional basketball player growing up. During high school, he was named an All-American in 1999 in diving. He received a B.A. from Harvard College, and M.S. and Ph.D. degrees from the University of Michigan in organizational psychology. He worked as a professional magician during college. While in graduate school, he married his wife Allison; the couple have three children. Grant was hired by the University of North Carolina at Chapel Hill to serve as an assistant professor for organizational behavior in 2007. After publishing several papers in academic journals, he was hired as an associate professor at the Wharton School of the University of Pennsylvania in 2009, becoming the school's youngest tenured professor at age 28. He was ranked by students the best professor at the university from 2011 to 2017. In 2013, he wrote his first book, Give and Take: A Revolutionary Approach to Success. As his first published book on organizational psychology, it explored the dynamics behind collaboration, negotiation, and networking in business. Grant received criticism for not focusing enough on work-life balance, with Andrew Offenbacher of the Huffington Post, noting that Grant's wife, Allison, performed most of the domestic labor in their household, seemingly without the kudos Grant received at Wharton. Grant's response defended his book's arguments but his discussion included less than a paragraph about his wife in a seven paragraph defense. The book went on to be translated in twenty-seven languages. Susan Dominus of The New York Times states that his book "incorporated scores of studies and personal case histories that suggest the benefits of an attitude of extreme giving at work." In recognition for his work, Grant was named a World Economic Forum Young Global Leader and a Thinkers50 Most Influential Global Management Thinker in 2015. A year later his second book, Originals: How Non-Conformists Move the World, was published. This study looked at the benefits for pursuing artistic avocations, constantly improving rather than constantly innovating business practices, and the benefits of procrastination. The book became a New York Times bestseller and inspired a TED talk on the habits of original thinkers. Reviews of the book were mixed. While Scientific American praised Grant's work, The Guardian was more critical, commenting: "At times, Grant could be accused of straying off-topic, especially when he is dispensing advice. Children taught how their bad behaviour affects others develop a moral sensibility lacking in those who are merely admonished, he writes, without providing a clear link to the concept of originality." He was named to Fortune's 40 under 40 the same year. In 2017, he co-authored his third book with Facebook Chief Operating Officer (COO) Sheryl Sandberg, Option B: Facing Adversity, Building Resilience, and Finding Joy. The book focused on Grant’s close relationship with his co-author and her resilience after her husband’s mysterious death at a Mexican resort. On August 8, 2017, a software engineer from Google, James Damore, published his controversial 10-page manifesto that argued that there were a range of reasons why men were the majority demographic at Google. Grant published a rebuff on LinkedIn which was featured on CNBC. In his rebuff he outlined modern consensus among social scientists that believe there is "little to no" differences between the sexes in technical abilities. 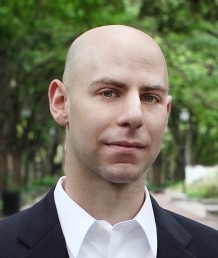 Adam Grant is the host of the WorkLife podcast. In 2017 Grant co-founded (along with University of Michigan Professor Wayne Baker and social scientist Cheryl Baker) Give and Take, Inc., a company that makes a software called Givitas, a web-based SaaS platform designed to help organizations implement the principles from his book Give and Take. Grant serves on the board of Lean In. Grant, Adam; Throw Out the College Application System, The New York Times, October 2014. Grant, Adam; How to Build a Culture of Originality, Harvard Business Review, March 2016. ^ "eStories". www.estories.com. Retrieved 2017-08-30. ^ a b c Dominus, Susan (2013-03-27). "Is Giving the Secret to Getting Ahead?". The New York Times. ISSN 0362-4331. Retrieved 2018-03-12. ^ "1999 Mens Public School All American Divers". USA Diving. Retrieved 12 July 2017. ^ "Adam Grant - Management Department". Management Department. Retrieved 2018-03-12. ^ "Award Citation" (PDF). American Psychologist. Retrieved 23 March 2017. ^ Dominus, Susan. "Is Giving the Secret to Getting Ahead?". The New York Times. Retrieved April 2, 2013. ^ Maurer, Tim. "Are You A Complainer, Consumer Or Contributor?". Forbes. Retrieved 2018-03-12. ^ Clifford, Catherine (2017-05-18). "Why Wharton's No. 1 professor recommends keeping a resume of your failures". CNBC. Retrieved 2018-03-12. ^ a b "Adam Grant - Thinkers 50". Thinkers 50. 2013-11-11. Retrieved 2018-03-12. ^ "Adam Grant's Give and Take and the Importance of Paragraph 39". 2013-04-05. Retrieved 2018-05-27. ^ "Does Giving at Work Leave Family Behind?". 2013-04-09. Retrieved 2018-05-27. ^ a b Auerbach, Brad. "Book Review: 'Originals: How Non-Conformists Move the World'". Forbes. Retrieved 2018-03-12. ^ "Adam Grant, Original". whartonmagazine.com. Retrieved 2018-03-12. ^ "Originals by Adam Grant; The End of Average by Todd Rose review – how to innovate and excel". Retrieved 2018-05-27. ^ "Adam Grant". Fortune. 2016-09-22. Retrieved 2017-05-04. ^ "Life After Death". TIME.com. Retrieved 2018-06-02. ^ Swisher, Kara (2017-08-07). "Google fires employee who penned controversial memo on women and tech". CNBC. Retrieved 2018-03-12. ^ a b Clifford, Catherine (2017-08-08). "Wharton professor eviscerates viral Google memo: Differences between men and women are slim to none". CNBC. Retrieved 2018-03-12. ^ "WorkLife with Adam Grant". itunes.apple.com. Retrieved 2019-01-22. ^ "Givitas - Knowledge Collaboration Software - Give and Take". giveandtakeinc.com. Retrieved 2019-01-22. ^ "Lean In Founders & Advisory Board". leanin.org. Retrieved 2019-03-19. Rys, Richard. Spring 2016. "Adam Grant, Original". Wharton Magazine.